Insider’s Bordeaux is one possible description of Château Haut-Bailly, a substantial Cru Classé property in Pessac-Leognan, home of the greatest wines of the Graves region of Bordeaux. The vineyards of Haut-Bailly are acknowledged as one of the great terroirs of France, where the sand and gravel soils sit on a bed of fossils, in the highest slopes of the region. With 65% Cabernet Sauvignon, 25% Merlot and 10% Cabernet Franc, Haut-Bailly can also claim around 15% of their vineyards to be ancient, pre-phylloxera French rootstock, never grafted to American vines. I had dinner with current Manager of the estate, Veronique Sanders (right), in London recently, where we also tasted through six vintages representing over three decades of Haut-Bailly’s wines. Veronique is the grand-daughter of Daniel Sanders, who bought the estate in 1955, and who was responsible for the total renovation of the vineyards and buildings, endowing the high status in which the wines are held today. In 1998 the estate passed out of the Sanders family hands when it was sold to an American Banker, Robert Wilmers. 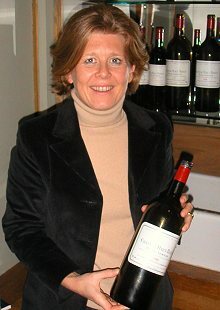 Veronique and her management and technical team were retained however, and Wilmers’ policy was very much one of gradual evolution for the estate, with no wholesale changes and no designs to re-engineer” the wine. Veronique speaks of her estate with obvious pride and tremendous passion. The hallmark of Haut-Bailly has always been elegance and refinement; and that is not to say lack of fruit or complexity. These are beautifully balanced wines that are archetypal claret, with their cedary finesse and purity of fruit. I asked Veronique if there was never a temptation to alter the style of the wines under the new ownership, perhaps in an attempt to court higher ratings from Parker or other critics? “I will be perfectly honest”, she replied, “when our 1999 was tasted from barrel by Parker in 2000 we were shocked when he awarded it only 78-points. The whole estate was devasted. I went to Mr Wilmers and asked ‘Do you want us to change Haut-Bailly’? I felt I had to make that offer”. Such a poor score from Robert parker could be the death knell for any vintage, but happily for this historic estate, the answer was a resounding no: it appears that Robert Wilmer had confidence in his wine and his team, and the instruction was to go on, and make no radical changes. In fact, Robert Parker re-assessed this vintage of Haut-Bailly again in 2001 and 2002, awarding 87, then 88-points, admitting that he had mis-judged based on the evidence of that early sample. The Haut-Bailly style continues, as evidenced here by the 2000 vintage, providing clued-up Bordeaux lovers with beautiful wines of considerable longevity, at very modest prices. Veronique has a twinkle in her eye when she says to me “if someone says they are a great expert in the wines of Bordeaux, ask them if they know Haut-Bailly. If the answer is ‘no’, then they do not have such a great knowledge”. These wines were all supplied by Seckford Wines, who are a main agent for the wines of Haut-Bailly. This wine has a very vivid, solid crimson/black colour and a beautifully fragrant nose of cedarwood and pencil-shavings, with a touch of briar and very sweet cassis fruit. On the palate it is closed and dense, with obvious fruit and concentration, but all sheathed in firm tannins and the youth of this wine. Needs many years. Excellent. The 1996 is a much less saturated, but still deep colour, and has an immediately more open nose with more pencil-shavings and sweet black fruit, and just a little glimpse of game. The palate is more approachable too, with a slightly more open-knit texture and good fruit, though still very young and constrained by firm tannins and a lovely acid balance. This wine could be drunk now with roast beef or other robust foods, but really it needs time. Excellent. This wine has another great nose: a note of gamy, animal character with a little bloody streak joins the ripe, juicy fruit and incense-like, cedary notes. The palate is not quite so full or voluptuous as the 1990, and the wine has more structure and a slightly more intellectual character with complex tannins and acids. Veronique said she could not make up her mind which of this pair she preferred, but although the 1989 is a classic claret – possibly the more classic of the pair – the extra opulence of the 1990 gets my vote. Still a great wine of course, and excellent. Like almost all the 1986’s I’ve tried, a rather impenetrable wine at present, with the elegantly wrought oak, pure fruit and finesse of Haut-Bailly all hinted at beneath quite a tough, sinewy, veneer of tannins and tight acids, with aroma and flavour both quite subdued. This is a full-textured and clearly structured wine, yet a nagging doubt has me wondering if it will blossom in the way that the 1990, or 1989 has already shown. Very good indeed. The only wine of the night to show real maturity, the 1970 has a gamy, bloody, old-clarety nose with animal and vegetal aromas distorting the purity of the fruit, but at the same time adding a perfumed complexity and richness. On the palate it is savoury and still shows really good fruit, that is silky and cherryish, with an autumnal, leafy quality and more of the that herbal and slightly drying profile. Tannins are now softened, but the wine is balanced with the acidity not too prominent and a lovely length. A beautiful wine and hanging on to an excellent rating.